. . . and babies make four. : A beautiful Easter Sunday. 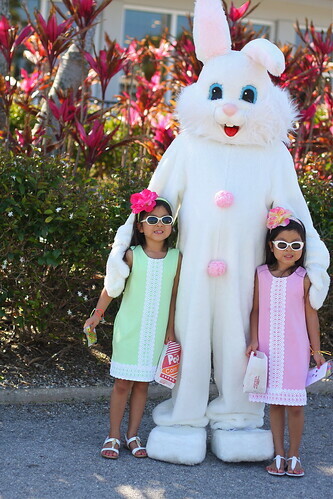 9:15 a.m. We arrive at the Easter Egg Hunt and Michal and Kenna are ecstatic when they see the Easter Bunny. 9:30 a.m. The scheduled start time for the much-anticipated Easter Egg Hunt finally arrives. 9:31 a.m. 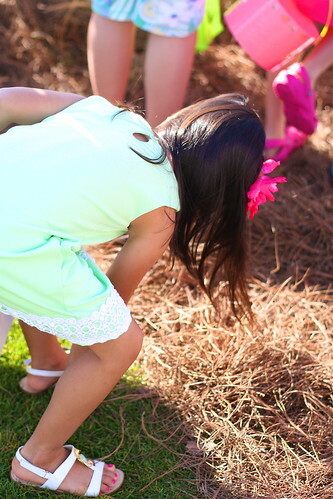 The Official Egg Hunt Starter yells, "Go!" 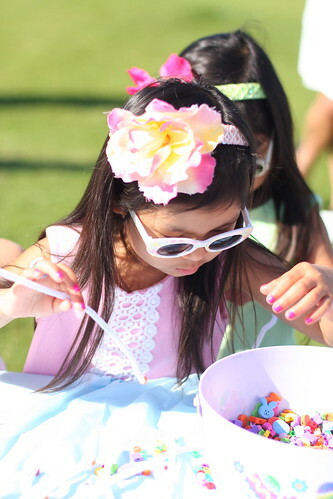 and the first group, ages 0 to 2, crawls, toddles and walks to their egg hunting area. 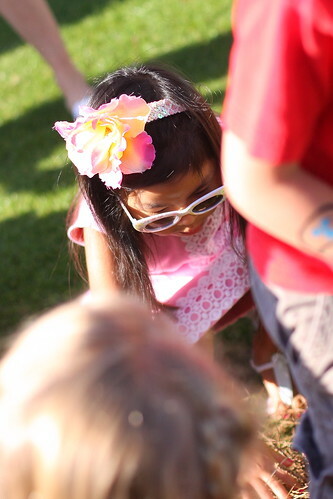 Michal and Kenna patiently wait behind the rope with the ages 5 to 7 group of egg hunters. 9:34 a.m. The Official Egg Hunt Starter yells, "Go!" for the second time intending for the ages 3 and 4 group to start. 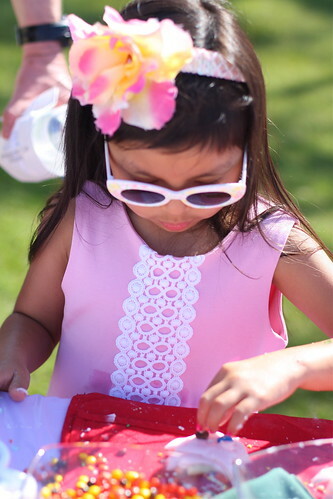 Instead, several egg hunters in the neighboring ages 5 to 7 and ages 8 and above groups hear the starter, jump over the rope and head for the eggs. 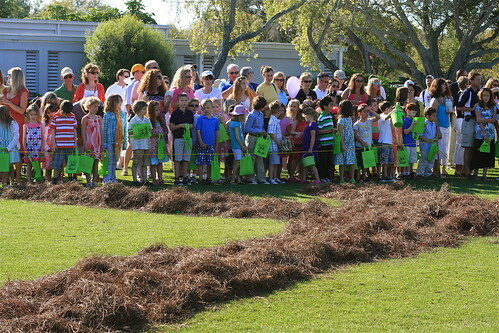 A moment of chaos ensues as some parents try to grab their little rope jumpers and put them back at the starting line while others try to lift their egg hunters over the rope and point them in the direction of the eggs. Finally, someone just lowers the rope and the mad dash for eggs takes place. 9:37 a.m. In less than three minutes all of the eggs are found. 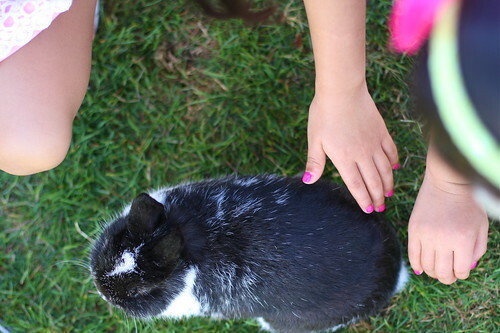 9:55 a.m. Michal and Kenna make their way to the bunny petting area where a sweet little bunny gets petted and petted and petted. 9:40 a.m. On to the craft area. Michal and Kenna decide to make Easter wands out of the provided beads and pipe cleaners that were intended to be made into bracelets. 9:50 a.m. Then on to cookie decorating, which means squirting on as much frosting as you possibly can and then covering the frosting with M&Ms and sprinkles. 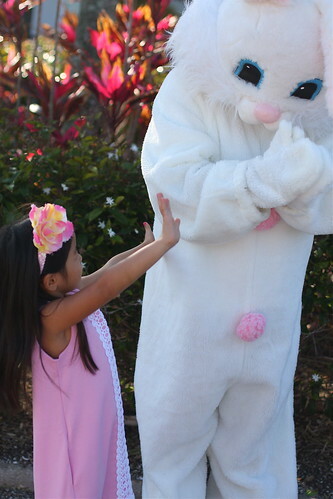 11:30 a.m. Easter brunch and a second visit with the Easter Bunny. 1:30 p.m. Back to the beach for one final afternoon. A very Happy Easter all the way around. The last photo is adorable. Did you come home to snow? No! We came home to a huge rain storm but it was really warm -- one day in the 80s! -- while we were gone and everything had started blooming. The trees were totally bare when we left and had leaves on them when we got home. The forsythia are all in bloom and so are the daffodils and some of the tulips. 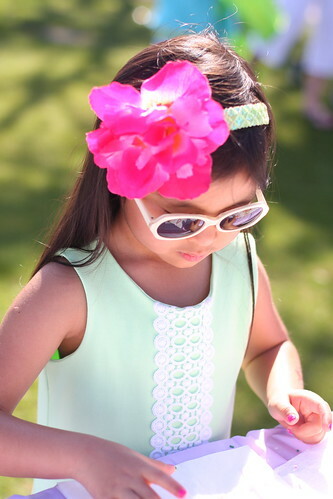 I love the girls' dresses! That last picture needs a frame, it's beautiful! Those are very very cute dresses! 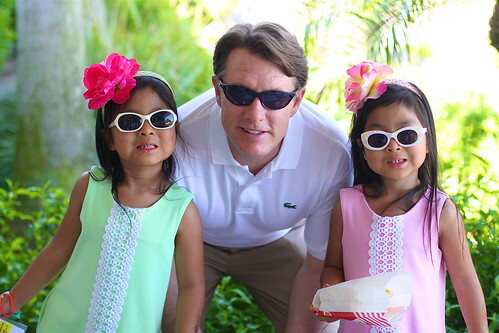 What a fun (and sunny) vacation! Where did you find those adorable rolling backpacks the girls have in the last picture? They are growing so fast! 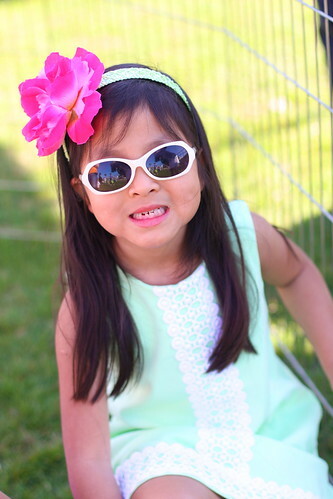 Their headbands are by Screamin' Beauty and are available at lots of children's boutiques. 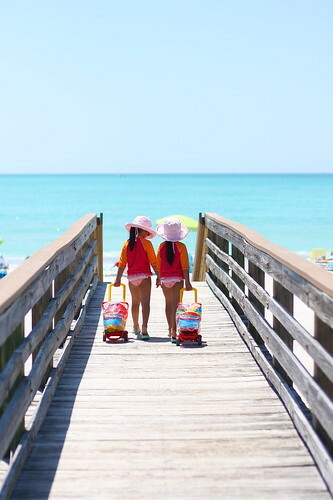 I bought the rolling backpacks filled with sand toys at CVS in Florida. They were great! The girls each picked out a child on the beach to give them to before we came home. I just saw the same ones at Tuesday Morning here yesterday. Hi Kristi - you always find the cutest things! Wondering about the Bogs from another post - do they run big, are they too much for spring-rainy days, and are they heavy? Thanks!